If you like the Phantom 3 Standard but need a quadcopter that’s more capable, the Phantom 3 Pro grants your wish. The DJI Phantom 3 Pro has a better camera that shoots 4K video, more positioning sensors, indoor flight capability, nearly 5 times the range, and a more sophisticated remote controller. You can also buy it from Commercial Drones as a refurbished unit, which means you save money compared with a brand-new model. And, of course, Commercial Drones’ technical expertise and its vast offerings of accessories and spare parts only sweeten the deal. This is the Phantom 3 model that truly delivers professional-level performance at an affordable price. The Phantom 3 Pro is highly maneuverable and records in true high definition — 4K video, the level of clarity that’s needed by professionals who record events and that’s desired by amateurs capturing the activities they share with friends and family. A Phantom 3 Pro that is refurbished is one that was returned by the original buyer. The original buyer either found a defect or simply wasn’t satisfied with the drone. DJI professional technicians go over it thoroughly, addressing any known defects and looking for any other possible problems. Those problems are corrected, and the unit is tested. Once it’s in tiptop shape, it’s given a new serial number ending in “R.” It carries a warranty identical to that of a new drone. The return policy, however, differs: A refurbished Phantom 3 Pro can be exchanged within 7 days, but only for another refurbished DJI product. The Phantom 3 Pro weighs a mere 2.8 pounds with its Intelligent Flight Battery onboard. Its four compact but powerful motors help it ascend at more than 16 feet per second. It descends at nearly 10 feet per second. The Phantom 3 Pro can top 35 mph, so you’ll have no trouble tracking newlyweds leaving the chapel, bikers taking on a rugged path, skaters, surfers, canoeists or runners. Phantom 3 Pro can fly for up to 23 minutes on one charge to its compact LiPo battery. You can buy extra Intelligent Flight Batteries so you can return to base and quickly snap out the depleted battery and snap in a fresh one. You’re back in the air in seconds. The included remote controller makes flight easy and responsive. You’re in total control, but there are many features that help ease the job of piloting your drone. The Phantom 3 pro transmits its view in 720p, while it records in 4K video, so you can see what it sees on your smartphone or tablet. Transmission range is 3.1 miles. Two spring-loaded control sticks allow you to command your drone in flight — up, down, forward, back, right, left. You can also make it pivot right or left. The sticks automatically center when you let go, telling the Phantom 3 Pro to stop and hover as it awaits your commands. A thumbwheel lets you move the gimbal up and down. You can also program two buttons on the controller for functions you choose. Built-in WiFi helps you link to your drone and see the live view, advanced onscreen camera controls and a map of where you’re flying. The DJI Go App, which does the linking and sets up controls, is free. Download it online. The remote controller charges with the same charger that your batteries use. The controller alerts you when the built-in battery is running low. Phantom 3 Pro contains both GPS and visual sensors, plus a barometer that can be used for placement. The DJI Go app lets you fully control the drone manually or use programming that makes some tasks one-button friendly, including takeoff and landing, returning to base, or returning precisely to a spot to resume shooting. Toggle onscreen between still and video shooting. One button starts and stops video recording. You can set ISO from the screen. Telemetry information is displayed onscreen. The Phantom 3 Pro has three modes, and some of them have options available. They help you fly by GPS or visual sensors, and do things such as set a new home point or a point of interest, which the drone will circle while the point of interest automatically remains the focal point. The camera on the Phantom 3 Pro has a preset focus that’s optimized for aerial shooting. Shoot 12MP stills in bursts up to 7fps. Many digital handheld cameras can’t do that. Record stills as JPEG files, or as DNG RAW files so you can do more detailed editing. The 4K video is significantly higher resolution than what is available on the P3 Standard and older Phantoms. Video records at 30 frames per second, and files transfer at 60 Mbps. The f2.8 aperture captures blur-free stills and video. The sensor is 1:2/3 inch. To limit distortion, the lens is a 20mm equivalent in 35mm format. The 3-axis gimbal is fixed to the camera, and the camera is fixed to the gimbal. The gimbal makes video shake-free. It can move up, down, right or left to counter movements of the drone, so the video shows no shaking. It’s the same principle Hollywood filmmakers use, but on a smaller scale. What matters is that your still images are sharp and your video is smooth. The gimbal also helps the Phantom 3 Pro shoot time lapse photos. You can share video live to YouTube. Once you download video and stills to your computer, you can edit them and share via other social media and e-mail. The Phantom 3 Pro can access both GPS and, if that’s not available, the Russian satellite system, GLONASS. Satellite positioning lets you send your drone exactly where you want it to be, and tells you exactly where it is. That means it will remember a spot if you want to return there so you can resume shooting. You can also set points of interest, which the drone will circle, pointing its camera constantly at the point you designated. The GPS map and information displayed on your connected device indicate where your drone is and its altitude, and which direction the drone is facing. GPS lets your Phantom 3 Pro remember its path, so it can retrace that path and return safely to you when you give the Return Home command. The Phantom 3 Pro also has visual positioning sensors, which add several capabilities. Visual positioning enables indoor flight because the sensors will detect objects in their path. Visual sensors also help you maintain a desired height above uneven terrain. What is the meaning of refurbished? Some buyers return drones, maybe because they’re defective but frequently because the drones are just not what they expected or wanted. DJI technicians correct any defects and test each unit. Once it passes inspection and testing, it is given a new serial number, repackaged and sold at a discount. How does the refurbished warranty differ from that of a brand-new Phantom 3 Pro? A refurbished warranty is identical to a new warranty. Can I return the Phantom 3 Pro Refurbished? Within 7 days of purchase, but a DJI refurbished product may be exchanged only for another DJI refurbished product. 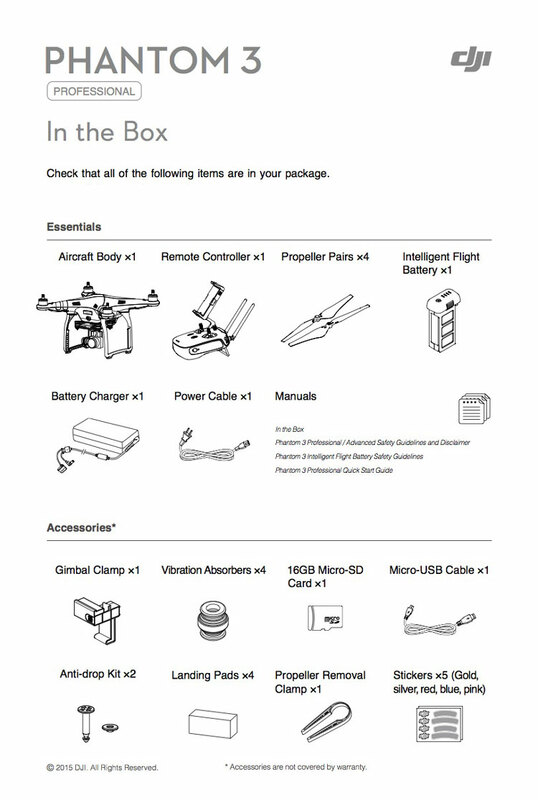 Are refurbished Phantom 3 Pros designated differently from new models? Yes. A refurbished unit receives a serial number ending in “R”. What is the resolution of Phantom 3 Pro still photos? 12MP. What is the resolution of Phantom 3 Pro video? 4K. Is 4K video considered high definition? Absolutely. It is suitable not just for weddings, but also for high-quality website video, commercials, TV news and big-screen viewing. Can the Phantom 3 Pro shoot stills in bursts? You can choose from 3/5/7 frames per second. What is the storage capacity, and can it be increased? The standard micro SD card is 16GB. You can insert a card up to 64GB. Can I share video? Share it live on YouTube. Once to download video to your computer, you can share it later to other social media or e-mail it. Is the lens interchangeable? No. Each lens is fixed to the camera. Does the camera have a zoom lens? No, it is a fixed length, equivalent to 20mm on a 35mm camera. To get a closer view, the drone must be flown closer to the subject. What is the field of view? 94 degrees. Is video stabilized? A 3-axis gimbal cancels out movement caused by the flight of your P3 Pro, steadying the camera and making video shake-free. Are camera filters available? A UV filter is standard. Graduated filters are available in a set of three. Color and ND filters are available in sets of three or six. What is the ISO range? For video, 100-3200. For stills, 100-1600. What is the range of the Phantom 3 Pro? 3.1miles. How do I extend range? The FPVLR antenna upgrade for your Phantom 3 Pro remote controller increases range up to 3x. professional installation by Commercial Drones technicians, which is recommended, is affordable and quick. How long can the Phantom 3 Pro fly? Up to 23 minutes on one battery charge. How fast is the Phantom 3 Pro? Its top speed is more than 35 mph. The Phantom 3 Pro can ascend at up to 16 feet per second and descend at 10 feet per second. What’s in the box? Remote controller, drone, gimbal-mounted camera, battery, charger, cables, props and manual — same as with a new Phantom 3 Pro. Does the controller have a video screen? No, but it hooks up by the included USB cable to your compatible smartphone or tablet so you can see video and have a touchscreen for commands. The controller has an adjustable mount. Which operating systems are compatible with DJI GO? Your device must run on iOS 8.0 or later, or Android v4.1.2 or later. Can two controllers be used simultaneously for the aircraft and camera? No. The included controller is used by one person for both the camera and drone. Is the DJI Go app included? Download it free from the Apple App Store or Google Play, depending on your device. How far is video transmitted live to the controller? Up to 3.1 miles, in 720p, although your camera records in 4.7K resolution. Do I have to watch the clock to know that my battery is running low? No. You’ll get a warning from DJI Go. Command your drone to Return Home. Your Phantom 3 Pro remembers the safe path it took and follows it back to you. What if I need spare parts or accessories? Easy. Just go to the parts/accessories page on Commercial Drones. You’ll find everything from the tiniest screws to vibration-absorbing parts, propellers and replacement motors. Must I repair my Phantom 3 Pro myself? You can go online to arrange for complicated repairs or upgrades by Commercial Drones professional DJI-trained technicians. But you can do many simple repairs alone: replace a broken landing gear, a wire, a burnt-out motor, or a compass, for example. What do the sticks on the controller do? They let you send your drone commands to fly up, down, left, right, forward and backward, and to pivot. What are the three flight modes? P-Mode (positioning), which has three options that are chosen automatically by your drone: P-GPS, when both GPS and visual positioning are available; P-OPTI, when GPS is not available but visual positioning is available; and P-ATTI, when GPS and visual are not available, and positioning is by barometer only. A-Mode, when positioning is by barometer only and a Home Point can be chosen and returned to. F-Mode, which allows locking the camera view to the direction of travel, choosing a home point or selecting a point of interest. What if the signal is lost? DJI Go’s flight assistant automatically commands the drone to return home, or to its set home point, the latest of which it remembers.